See also: Levi Coffin and Quaker Emigration, Quaker Abolitionists. Quakers, or the Religious Society of Friends, are the oldest organized Christian church in North Carolina. Founded in England through the prophetic insights and evangelical ministry of George Fox, the sect expanded rapidly after the mid-seventeenth century. Self-described as ‘‘children of light,’’ the Friends eschewed both creed and ritual to live a sacramental life that followed the leading of the Holy Spirit, which they sought in open worship and meditation. Their core belief in the sacredness of human life was the basis for their testimonies on the human family, gender equality, pacifism, and the abolition of slavery. Their vigorous public witness against political, social, and religious discrimination led to their persecution in England and the eventual establishment by William Penn of a colonial refuge in Pennsylvania. North Carolina Quakers originated as a result of a missionary band that George Fox led to the Caribbean and North America in 1671. Leaving Fox and the others, the Irish evangelist William Edmundson visited the Albemarle region in March 1672 for three days, holding the first religious services in the colony and laying a foundation that would result in North Carolina’s becoming in its early years virtually a Quaker province. That November, George Fox spent nearly three weeks in the settlement leading numerous worship services, meeting with the governor and other officials, and preaching to the local Indians. When Edmundson returned to the colony in 1676, he reported that Friends were ‘‘finely settled.’’ Tradition has it that the earliest meeting for worship was established in present Perquimans County at the home of Francis Toms, which was also the site of the first meeting in 1698 of North Carolina Yearly Meeting, the oldest extant religious organization in the state. The earliest existing meeting records, which date from 1680, are from Perquimans Monthly Meeting. By the end of the century there were two monthly meetings in Perquimans and another in Pasquotank. Strong believers in the importance of education, Quakers apparently sponsored the first school in the colony, which was begun in 1705 adjacent to the Pasquotank (later Symons Creek) Monthly Meeting. Quakers exerted an important influence in the political life of the Proprietary colony. Among the many Quaker government officials and Assembly representatives was John Archdale, who was not only a Proprietor but was also governor of Carolina (1694–96). Friends are on record as protesting the unrest generated by Culpeper’s Rebellion, and in 1680 nine Friends were imprisoned for refusing militia service. Following the Cary Rebellion of 1711, Friends were effectively excluded from colonial politics and thereafter seldom held office in the state until modern times. From a base of well-established meetings in the Albemarle region, Friends gradually spread into the counties south of the sound. By the mid-eighteenth century, the backcountry was growing rapidly because of a large influx of settlers from Pennsylvania and Virginia, some of whom were Quakers who formed meetings for worship in the Cane Creek valley and to the west in modern Guilford County. These meetings would draw some of the Albemarle Quakers west to the Piedmont. By 1751 Cane Creek Monthly Meeting was established, followed in 1754 by New Garden. North Carolina Friends entered a century-long period of decline during the civil strife that began with the War of the Regulation and continued into the American Revolution. The pacifist Quakers were particularly affected by the military operations and the protracted violence of the internal conflict between the Whigs and Loyalists. The key factor, however, in the diaspora of southern Quakers was their witness against slavery, which began in the late eighteenth century and intensified in the nineteenth century. Quakers organized manumission and African colonization societies and gradually began to advocate abolition of slavery. 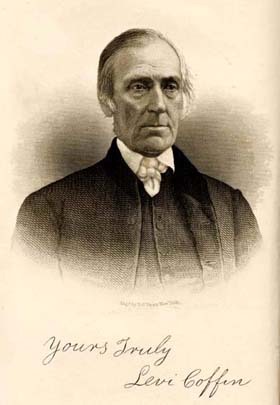 Levi Coffin of Guilford County was a founder of the Underground Railroad, which enabled thousands of slaves to escape to freedom. The southern community met the Quaker antislavery stance with escalating hostility, precipitating mass migrations of Quakers to the free states of Ohio and Indiana. A major accomplishment of North Carolina Friends in this period was the opening in 1837, under the guidance of Nathan Hunt, of New Garden Boarding School, the oldest coeducational school in the South. 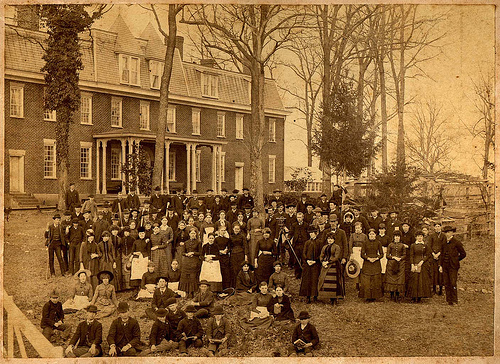 By 1888, from this small beginning, evolved Guilford College, which has achieved a national reputation for excellence as a liberal arts college. At the college are the Quaker Center, which has an important role in interpreting the beliefs and practices of the denomination, and the Quaker Historical Collection, which is the archival repository for southern Friends. During the Civil War North Carolina Friends were persecuted by Confederate authorities for their radical views on slavery as well as their refusal to support the war effort. By the end of the war there were few Friends left in the state, and without the aid of northern Quakers, particularly the support of Francis King and the Baltimore Association, the church might have disappeared from North Carolina. The Baltimore Association established schools for both whites and freedmen, formed new meetings, and set up a model farm near High Point to teach improved agricultural methods. A significant contribution to minority education was the High Point Normal and Industrial Institute, which was founded in 1891 and eventually was incorporated into the public school system as William Penn High School. In the nineteenth century Friends were divided by the effect of the spiritual fervor of evangelical revivals that swept the country in the Second Great Awakening. New converts, with little appreciation for traditional Quaker beliefs, readily accepted the theology and practices of other Protestant churches, especially the use of professional pastors. The new ideas were more evident in North Carolina after the Civil War when out-of-state evangelists began to hold revivals. From an 1887 conference in Richmond, Ind., emerged both a uniform discipline and eventually the Friends United Meeting, first called the Five Years Meeting. Although most yearly meetings had been divided along the previously noted lines, North Carolina did not experience a separation until 1904, when the North Carolina Yearly Meeting (Conservative) was established by a small minority. Presently there is extensive cooperation among all major branches of the Society of Friends—the Friends United Meeting, the Conservative, Evangelical Friends Alliance, and the Friends General Conference. North Carolina Yearly Meeting (Friends United Meeting) has grown to become one of the largest yearly meetings in the country. North Carolina Quakers are centered in Greensboro, where the denomination’s major institutions are located: the yearly meeting office, Guilford College, and Friends Homes, Inc., a nationally recognized retirement community. Nearby is Quaker Lake Conference Center, a youth summer camp facility and year-round conference center. Hiram H. Hilty, By Land and by Sea: Quakers Confront Slavery and Its Aftermath in North Carolina (1993). Hilty, New Garden Friends Meeting: The Christian People Called Quakers (1983). Seth B. Hinshaw, The Carolina Quaker Experience 1665–1985: An Interpretation (1984). "Faculty and Staff, New Garden Boarding School." 1886. Friends Historical Collection, Guilford College. Online at http://www.flickr.com/photos/fhcarchives/5436563980/. Accessed 12/2011. Thank you for visiting this entry and taking time to post your comment. I’m sorry you came across broken links in this article, but I appreciate you taking the time to let us know. I have checked all of the links in the article and have replaced those that were no longer working with new links. If you happen to return to the article, they should all be working now.